Have you ever wanted your child to learn more about being an actor or what is involved behind the scenes or how a play is put together? The answer is: summer drama camps that offer theatrical fun and challenges for kids from a young age to teenagers. 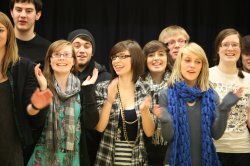 The courses offered in these summer camps usually explore the fundamentals of acting, improvisation, mime, clown, mask work, character development, script analysis, audition techniques, creative movement, and voice for the actor. The camps have been designed to give a strong technical foundation while providing a positive environment for personal growth and artistic expression. Summer camp is also about making new friends, working as a team, improving self-confidence and having lots of fun! All students will take on roles behind the scenes, as well as put their skills to practice acting on-stage, during a final public performance. In these summer camps, the students usually are taught by talented and expert instructors who had many years of experience in this industry and worked hard on their good reputation.